The one thing that anyone who's already married will tell you is how fast your wedding day goes by! Therefore, for me, it's so important that you spend as much time as possible with your loved ones and ultimately live every second of your special day. My style is all about storytelling. To be perfectly honest, most of the time you probably won't even realise that I'm there as I quietly fade into the background and document your wedding day naturally, as and how it unfolds. What you certainly won't get from me is someone who is constantly interrupting the action, bossing you and your guests around or taking you away for endless formal group shots! 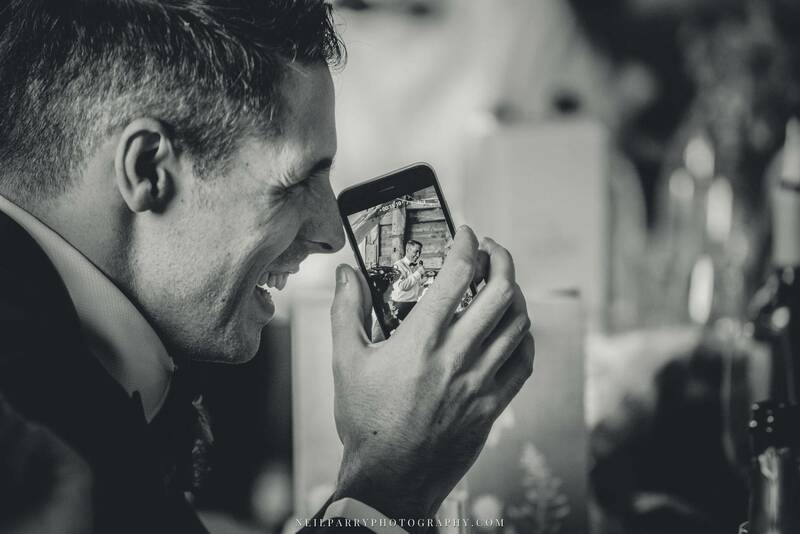 On your wedding day I want to focus on capturing your family and friends truly enjoying the day, providing natural, relaxed and fun images rather than taking countless posed shots of you and your guests all stood in a line, looking at the camera. That being said, if having a selection of group shots is important to you, I am happy to capture up to 6 combinations for you (close family, bridesmaids, groomsmen etc). Where are you based? Do you charge for travel? I'm based in Chester, Cheshire, in the North West of England but I will happily cover weddings across the whole of the UK and beyond! All UK travel expenses are included in the price quoted. Which camera model do you use? I use the awesome Nikon D750. Will you bring any back-up equipment? Yes. I shoot with two cameras on the day. Any photographer who takes their craft seriously should always carry back-up equipment. We're nervous about having our photo taken, any advice? Can you recommended any other wedding suppliers? Yes indeed! I have worked with some wonderful suppliers over the years and I'm more than happy to offer recommendations to my couples if required. As a wedding is a long (and often non-stop) working day for me, a hot meal and soft drink served in a separate room to your wedding breakfast would be greatly appreciated, thank you! How long will it be before we get our photos and how many will we get? Each one of your wedding photos will be individually edited in my creative, signature style and I work as hard as I can to make sure that your photos are ready as soon as possible without ever compromising the quality. During my busiest months, please allow up to 6 weeks for delivery. I never limit the number of photos that you receive but as a rough guide, you can expect at least 350 photos. You will have full printing rights but as is standard in this industry, the photographer always retains copyright of their work. With this in mind, I kindly ask that if you receive a request for images from one of your other suppliers to please notify me so that I can send them any images directly. I am more than happy to share images with other suppliers free of charge, however, it's very important that all requests go through me so that I can explain my copyright terms to them. If you would like to enquire about making a booking, please complete the form on the contact page with as much info as possible and I will be sure to get back to you as soon as I can. To secure a date, I require a booking fee of £400. This booking fee is non-refundable and will be taken off your final balance. The remainder of the balance will be due 8 weeks prior to the wedding date. Do we need to meet up before we book? This isn't essential but I do understand if you'd like to meet up before committing to a booking. My meetings take place in either a coffee shop or bar in Chester and can be booked between the hours of 9am and 3pm, Mon-Fri. Some evening appointments may also be possible, depending on the time of year. Please note that due to the number of weddings that I shoot, weekend meetings are not possible. ASAP! :-) Most couples tend to book me 1-2 years in advance of their wedding day and as you can imagine, peak season dates get snapped up very quickly! Yes, I have both professional indemnity and public liability insurance. I am also fully CRB/DBS checked.